Equities start the day lower as earnings finally matter! Hooray for that my friends! I spent an entire weekend at a water park with my kids (I could write a recap 8 pages long about my experience but it might come off a bit snooty) and while they dodged tattoo’d people and questionable liquids I read Twitter looking for something to write about. You know what I DIDN’T find over the past few days? A bunch of articles about Greece, how awesome is that? I reveled in the fact that Eurogroup commentary was sparse and talk about Grexit and Greferendums and Garbanzos were nowhere to be found. Just good old fashioned earnings and macro. Speaking of macro, how about this move in Gold? Another new low as the one precious metal looks incredibly tarnished. Imagine you bought Gold back in 2011 as Europe was threatening to crumble. How did your investment do? Well, if you held it to today you’re only down about 43%. Yikes….at least it’s not 100% right? (I’m a brightside guy) I was never a gold bug and I don’t really subscribe to the “anarchy” trade. I guess it could be a store of wealth if the world turned into a Mad Max movie but would you really want to live in that? Buying rice and band aids with your stash of silver eagle coins you held for just such an occurrence? Did you know the 5yr compound rate of return for the precious metals mining index is now the lowest in modern history? I guess I’m a stocks guy and always will be, but that’s not to say commodities don’t have their place in this game (see my news highlights). After the open it was lower for longer as we once again retreated from the top end of the range. How crazy predictable has that trade been? Three times we’ve tried to breakout and three times we’ve failed (this is possibly the third...we’ll see). No economic data to speak of so let’s move thru the earnings list shall we? LXK was the biggest loser down 20%. Guess that printer business is tougher than I thought. IBM (-5%), UTX (-7%), and VZ (-2.3%) were all whiff central which smoked the Dow for 1.25%. How bad was that move in UTX ? Only the re-open after 9/11 had a bigger one day drop…ouch. CHK fell 7% as it suspended its dividend and now everyone is looking at it with a wary eye. Significant amount of debt, losing money, and now no divvy….not an ideal combo at all. Any winners up in this mug? HOG, HAR, and ZION. Borrow some money and buy a motorcycle with a cool infotainment system because that’s what worked! (actually that doesn’t sound bad does it). By lunch the market felt horrible but it was only down 50bps to 2,117. One of those days where you look up and see endless red but I guess it wasn’t all that bad. The final hour brought a small rally but you know what, it went nowhere. We closed at 2,119 almost exactly where we were at lunch. So here we sit, at the top of the range once again. We NEED a catalyst to break this stupid deadlock. But you know what? We have one on deck…AAPL. Put your faith in the fruit my friends because if they blow it out tonight we could be off to the races. Final Score: Dow -100bps, S&P500 -43bps, Nasdaq -21bps, Rus2k -45bps. Succinct Summation of the Day’s events: garden variety pullback from the top of the range. Some ugly earnings but mostly just another failed breakout. Cullen looks at the commodity selloff a bit more pragmatically: “Commodities are never an asset to own, but rather something you rent with the hope of providing an uncorrelated return to further protect your stock and bond allocations. And they should never be the core piece of your asset allocation as they are cost inputs in the capital structure and not the instruments that provide long-term predictable cash flow streams. That said, all this bearishness has me feeling more bullish about the potential that we’re moving into a lateexpansion phase and a phase where commodities might do better than stocks and/or bonds at points in the coming years”. 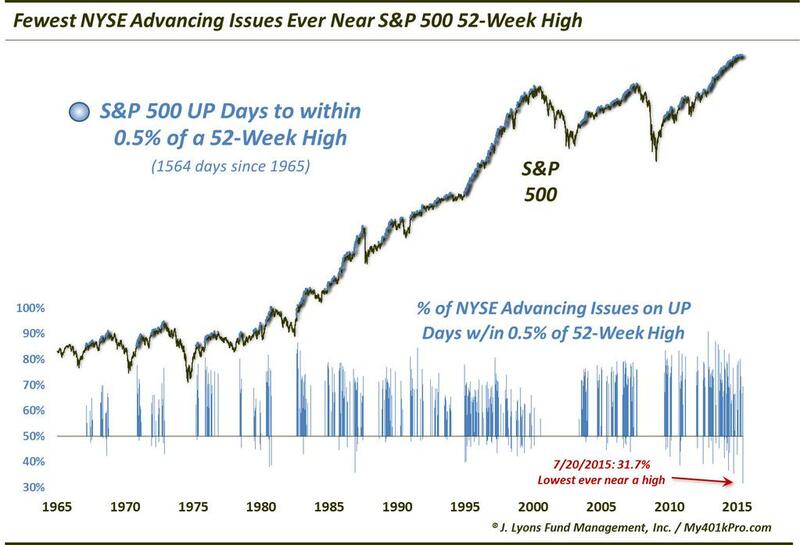 Chart of the day by J lyons shows the fewest NYSE advancing issues EVER near the S&P500 52wk high. Ugh, not good. 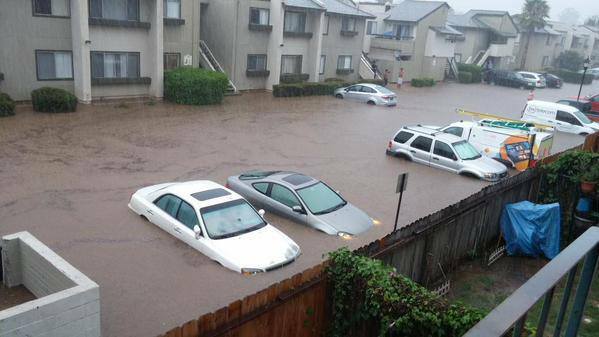 Whoever made this fence should use this picture for its advertising. Things Michael should’ve invented #40. I swear I hate making water balloons so much. I have a couple videos to end on tonight so I’ll give you a choice. The second video shows the worst special effects in movie history. This one made me laugh more than the first to be honest.